Just wanted to add that your post links to an Anonymous Bishop blog entry that doesn't exist (site gone). Attempting to access the Google cache had only a single hit which I thought was strange (did someone pay Google to make it go away?). 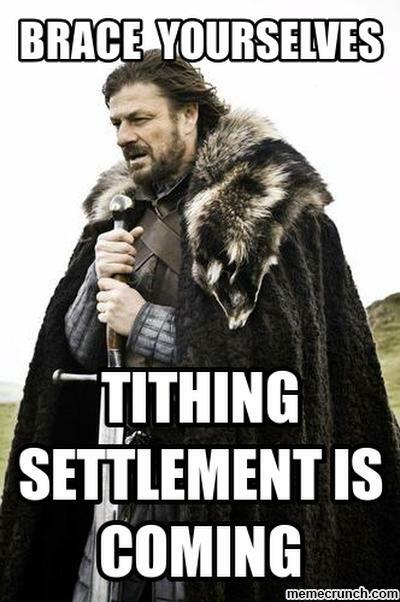 Tithing settlement is just a corporation doing a money shake-down. 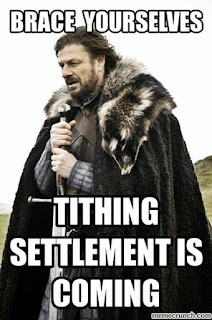 This year was my first time refusing to go to tithing settlement. What's the point? 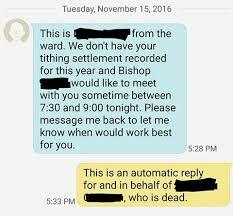 The bishop shows you your tithing statement (available online) and asks if you've paid a full tithe. Do I really need to come back to Church and have an opening and closing prayer just to say "Yes"? Besides, tithing is between me and the Lord. "For there is one God, and one mediator between God and men, the man Christ Jesus" (1 Timothy 2:5). It is literally none of the bishop's business - he is a steward of temporal things, and he can act as a judge for unrepentant sinners (hint: a person who comes into the bishop's office to confess is not unrepentant). That's it. I tell you what, I really want to be one of those people Rock always mentions who stays in the Church(TM) *because of* his blog. I teach 12-13 year-old Sunday school, and I teach them from the scriptures with a heavy emphasis on spiritual self-reliance, the primacy of the word of God (over conference talks), how to think critically about scripture (no, you don't have to believe that God gave all those awful Levitical laws), how to recognize false teaching (Suffer the children to come unto me vs. no baptism for kids of gay parents). I'm surprised I haven't been outed yet - I think my students just figure that this is what The Church(TM) is like outside of Primary. I really want to be one of those people who stays, because I think I'm doing good, and I think it's still good for me too, but I have daughters to think about. Daughters who are going to wonder why they can't pass the sacrament (there's actually no reason they can't). Daughters who wonder why all the *real* leaders are men. Daughters who won't be encouraged to pursue real careers (stay home with the kids, you'll have a husband who will take care of you). Daughters who are beginning to think that their appearance is what matters most (Church is where they get the most "oh how cute! how pretty!" comments). Daughters who are going to go into a baptismal interview and be asked if they sustain so-and-so as a prophet, seer, and revelator, when I'm explicitly teaching them the opposite. Daughters who are soon going to be encouraged to marry some fanatical follow-the-prophet returned missionary (we were all pretty fanatical for the first few years after we got back). Rock, this article here (https://mormondom.com/letter-to-a-mormon-man-8d251aa1f062) is something I've been thinking a lot about lately. With as much trouble I'm having with The Church(TM) as a man, I think that if I were a woman, I wouldn't have anything to do with Mormonism or Christianity, period (and I'm with you on the whole Joseph-was-not-a-polygamist thing). I was wondering if you could comment or post about this issue. An eternity of thanks for your blog, my brother. I think we need to get away from the idea of "church," as in a physical location. Joseph didn't want that, as I understand it. Yet the measure of one's righteousness and devotion to the Lord is measured in "church attendance." If you want a temple recommend, you have to attend all your dry, boring meetings. Then go to meetings before and after "church." Then some more meetings during the week where you plan more meetings. When we set up a "church," we set up a power structure. We then get power struggles, identity/gender politics, "equality" essays, "social justice," and all kinds of nonsense. Coming to Christ becomes secondary because everyone wants a piece of the power pie. It's all so stupid. "To the well-versed, a 'church service' is in reality a show put together to entertain Christians. God never meant it to be so. The gathering of Christians is supposed to be an opportunity for believers to edify and encourage one another." That's a church I can get behind. I'd like to see that article, Matt. 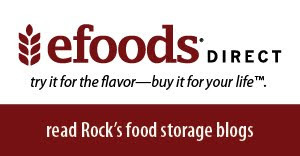 Do you have a link? Thanks for that link, Shaun. I don't know what more I could say about it that the author hasn't already said, though. That's my comment. Church services are not biblical, Jason says. Just today I came across the recording of a long interview on Mormon Stories Podcast, that has been uploaded on this very the 20th of december, with a brother saying at one moment he was not able to teach the gospel in a church class. It is a very interesting conversation, moving, and revealing, and I recommend it. Not because he advocates the cause of D. Snuffer, but because it is so clear about the state of affairs in the church and the direction it has taken. You have to take your time, as it takes some hours, but it is worth your time. Thanks, Jason, for pasting the link. It's quite sad isn't it. The church is such a mess. I honestly believe that most active members including the leadership believe that they are on the straight and narrow path that leads to the tree of life as the wander in the forbidden paths and refuse to hold fast to the iron rod. In spite of the church being very much out of order, I still think there is good there and that God continues to work with and through the members to the degree that they let Him. I think it's very similar to how things were during the Great Apostasy. In spite of the apostate condition of mankind, God did not abandon them, but worked with them as much as He could. People like Wesley, Luther, Zwingli, Joan of Arc, etc are proof of that. Eventually God will clean all this mess up. I hope soon. In the mean time all we can do is the best we can. Whether to stay with the church or go it alone is the tough question. I'm still going to church for now, but I feel the same pain you do. I want to stick it out at church, but it's tough. The worst thing anyone can do in this situation is chase after false prophets like Snuffer. There are clearly problems in the church, but there always have been. Some of the problems we face today are new to us, and some are not so new. Some people seem to have such high expectations. "The worst thing anyone can do in this situation is chase after false prophets like Snuffer." Can you clarify what you mean by that? Denver Snuffer has never claimed to be a prophet, and he denounces anyone who would follow him the way members of the Church are encouraged to follow Thomas Monson. Denver specifically denounces anyone who would look to him as their leader. "I have no respect," he has said on more than one occasion, "for anyone who calls him or herself a Snufferite." So, who do you know who is chasing after Denver Snuffer? If you know such a person, Denver would be more than happy to set them straight. He advocates that believers follow Christ, and no other; not Thomas Monson, not Denver Snuffer, not anyone except for Christ. I would note that in order for someone to be considered a false prophet, two elements would have to be present: 1. the person would have to claim to be a prophet, and then that person would have to issue a prophecy that failed to come true. I think I know Denver Snuffer pretty well, and I have yet to read of a prophecy conveyed through him that either turned out to be true or false. Why? Because he simply doesn't issue prophecies. He is a teacher, with 25 years experience teaching church classes in Gospel Doctrine. I have yet to find a gospel doctrine teacher with students who "chase after" him or her. By the way, as much as I would like to accuse Thomas Monson of being a false prophet, he doesn't qualify either, as he has never claimed to be a prophet, and he has never issued a prophecy or revelation. What he does have, however, is sycophantic followers who believe he is a prophet based on the fawning declarations of his underlings. Nephi tells us that those who follow any man are being led by Satan, and if they continue, will be led carefully down to hell. If Thomas Monson had any sense, or concern for the eternal well-being of others, he would tell his followers to knock it off and direct their focus on Jesus Christ instead. When you spoke of people who "chase after" false prophets, I think you may have been confusing Denver Snuffer with Thomas Monson. You can google a picture of each of them if that will help. They don't look or act anything like each other. I understand your defense of your friend Denver. You and I have debated whether or not Denver claims to be a prophet several times in the past. I really don't want to rehash that debate. I'd have to go through all of Denver's writings and claims again to see if he ever issued a prophecy or not. He certainly has claimed to receive revelation with his Testimony of St. John and a number of other things. In my book his Testimony of St John alone is enough to label him a false prophet, because the document he produced contradicts changes Joseph Smith made to the gospel of John in the JST. Denver has also claimed to speak for God a number of times. For example he gave instructions on how people were to be baptized, what words to use, etc. He also instructed people to form fellowships and set forth guidelines for how the were to operate. Seven women sustaining a man in the priesthood etc. Maybe you interpret following or chasing after a prophet differently than I do, but this is the way I understand it. Those who accept Denver as speaking for God and followed his instructions for baptism and fellowship organization are following him or at the very least are accepting him as God's spokesman. Denver can claim he seeks no following and is a servant or messenger and not a prophet, but his actions speak for themselves. He claims revelation and to have an assignment from God to deliver God's message. That's a prophet my friend. The only question is whether he is a true or false one. Denver's TSJ alone is enough for me to write him off as a phony. Please don't take that personal or as an attack. I honestly wish Denver did fit the part of a true prophet who God is speaking through. I wish Denver was the Davidic Servant who will restore all things and establish Zion. I wish it were all true. I really do. The fruits just aren't there though. There's too many red flags and things that are just off. Hope there's no hard feelings. I'm just calling it like I see it.